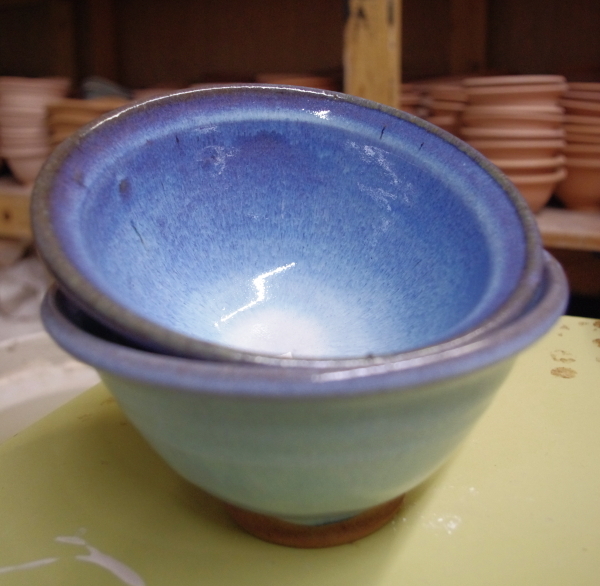 ur first glaze is from a family of Japanese glazes named Shino (s). Like the copper glaze of last year’s Bouja, Shinos react dramatically to the amount of oxygen present in the kiln’s atmosphere during the firing. Both pictures above are the same glaze, the one on the left is fairly oxygen starved, and the one on the right was in a more oxygen rich corner of the kiln. 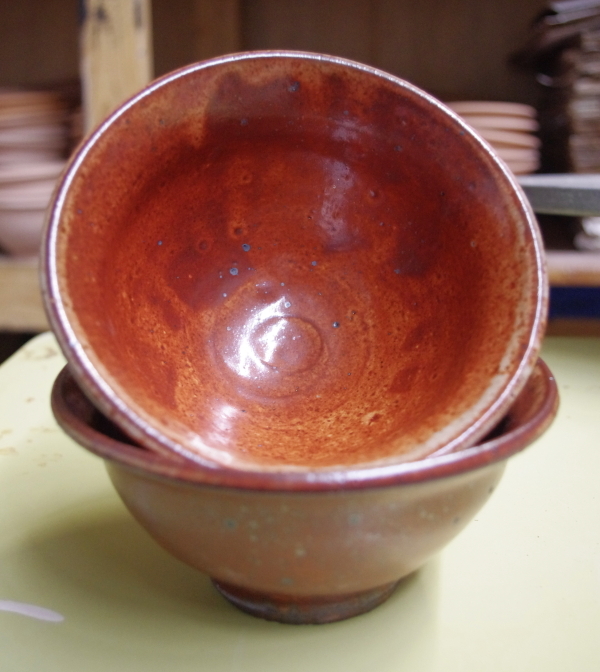 This shino gets it’s color in part from clay from the farm that is an ingredient in the glaze, and at times shows a iridescent, metallic sheen. Our next glaze is called a Chun glaze and gets it’s name from a striking family of glazes produced in China from the 11th to the 15th century. The word heavenly pops up all the time to describe the blues of these glazes. The blue to white hues float within the glaze giving it an opalescent quality. I don’t know that I have documented on this blog Dom’s quest to make his own pottery-grade iron oxide at the farm. 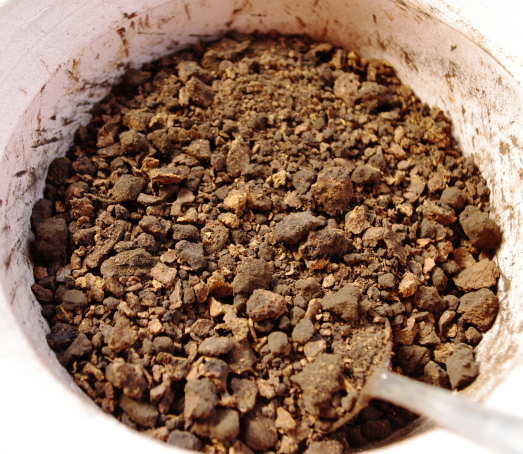 Iron Oxide is essentially rust, and potters use it frequently as a colorant in glazes, clays, and decorative slips, but it needs to be of a very fine consistency. Dom has been breaking down metal scraps, including chicken wire, that have come from the barn by running an electrical current through a saline solution. 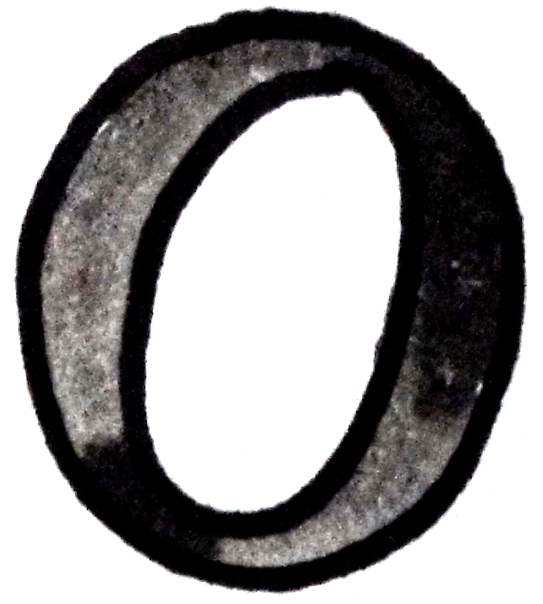 It has produced a unique sample of iron with traces of other metals, that is beautifully fine-grained. Potters can purchase Red Iron Oxide, Black Iron Oxide, and Spanish Iron Oxide, so I have been calling Dom’s iron, Barn Iron Oxide or BIO. 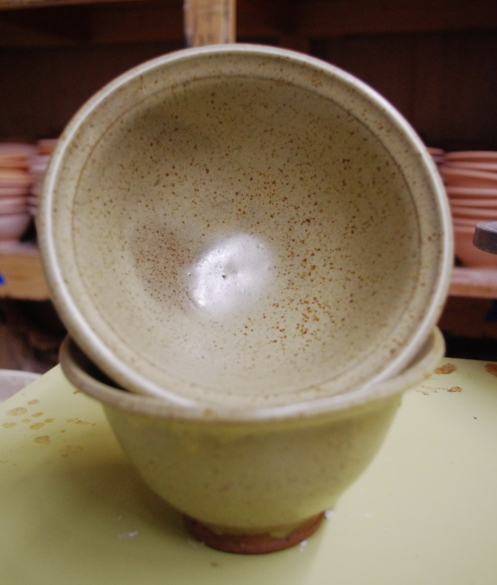 The next glaze I developed for the Bouja showcases the BIO in what is called a Tenmoku glaze. 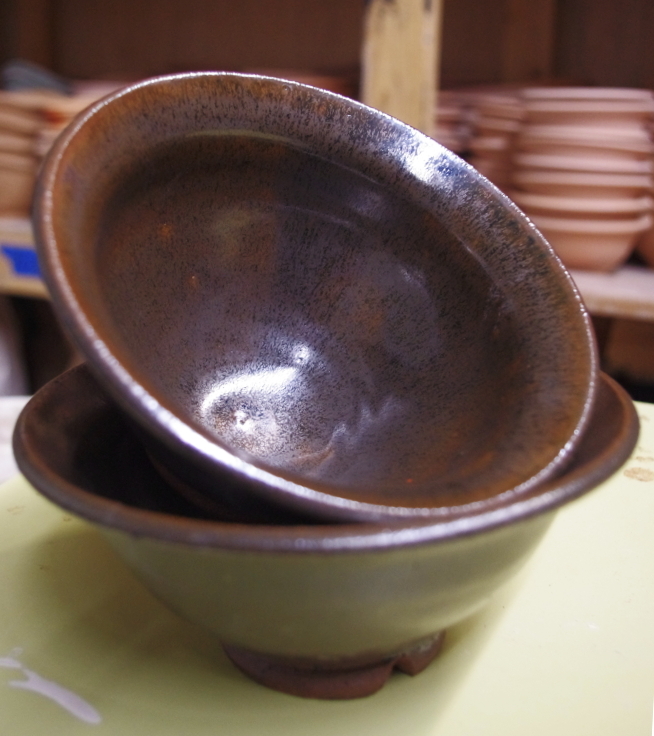 Tenmoku is a Japanese name for a family of glazes that are very rich in iron as a colorant. Our BIO Tenmoku also has a a significant amount of the ash from the cedar shingles we took off the barn, as part of the base of the glaze. The last glaze I have to show you thus far is designed to showcase the ash from the barn’s old shingles, and shows its character in an of itself. I am very pleased with this soft, unassuming glaze that turned out more lovely than I imagined. Its neutral color can read as gray, green, or yellow depending on the light, and when applied to bowls thrown from clay from the farm, small iron particles in the clay beneath come through the glaze giving it distinctive speckling. My friend Dana remarked it looks rather like a bird’s egg. 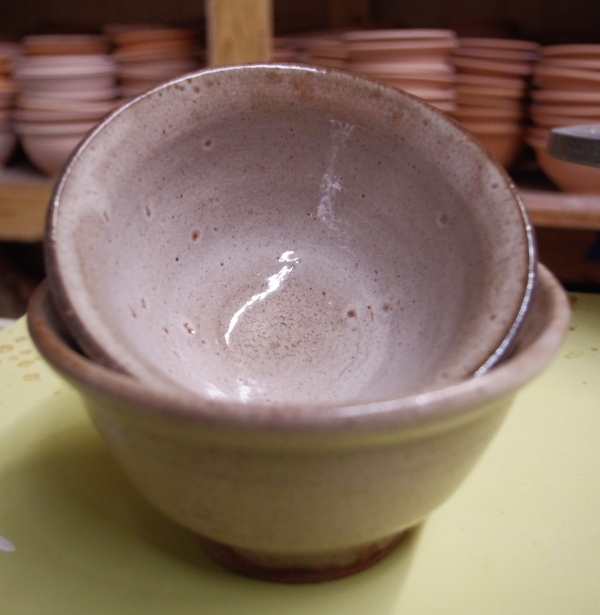 The first batch of bowls was unloaded over the weekend, and the second batch will be fired tomorrow. These glazes we’ve developed will be overlapped and used in combination on bowls, producing such a wide variety that I am certain everyone will find something they love. I am excited to show them to those of you who come to the Bouja! So beautiful! I am in love with earthy things: stones and broken geodes, wood, plants, wax candles, pottery, and things that come from nature. I feel rich surrounded by them. The wealthy have their gems, their fine art, their luxurious, expensive things. I’m grateful that I can see greater beauty and deeper meaning in clay. Your work is priceless. I can’t wait to meet it in person.